Invisalign & Braces - Dentallive Clinic LTD.
WHAT ARE BRACES & INVISALIGN? Maligned teeth may not only look bad but may give occlusion problems. Dentallive Clinic does in office orthodontics that help fix crooked teeth for patients of all ages. 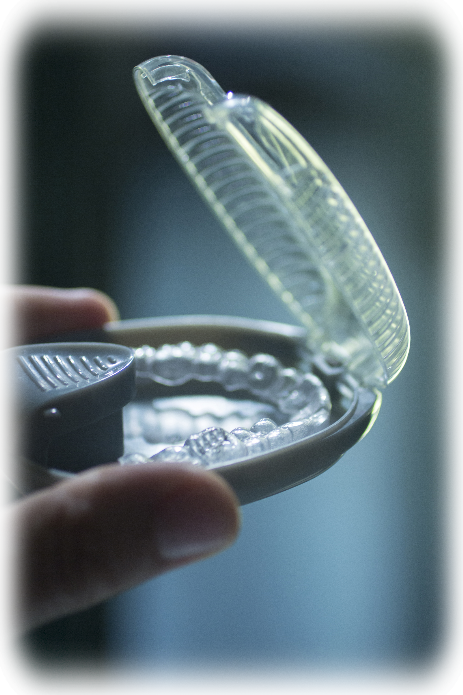 Now if your concerned about having metal in your mouth for 18 months Invisalign is a great alternative that provides clear braces. Orthodontics is the specialty of dentistry focused on the diagnosis and treatment of dental and associated facial irregularities. The results of orthodontic treatment can be dramatic — beautiful smiles, improved dental health and an enhanced quality of life for many people of all ages. Orthodontic problems, which can result from genetic and environmental factors, must be diagnosed before treatment begins. Proper diagnosis involves taking photographs, x-rays, and dental impressions, which enable our practice to make informative decisions about the form of treatment necessary. Treatment typically lasts from 6 to 30 months, depending on age and the severity of the orthodontic problem. Outstanding results are also dependent on maximizing the coordination of care between you and our practice. We are committed to delivering the best possible service in order for you to achieve your orthodontic objectives. We provide orthodontic treatment for adults, adolescents and children. We recommend that an orthodontic evaluation take place at age 7 for all children. This early evaluation can help to determine the best time to begin any necessary treatment. Braces use constant, gentle pressure, which over time, move teeth into their proper positions. Your braces are at work every moment of your orthodontic treatment. The two main components of your braces are: the brackets that are placed on your teeth and the main arch wire that connects them. The bracket is a piece of shaped metal or ceramic that we affix to each tooth. The arch wire is bent to reflect your "ideal" bite. In other words, it reflects the way we want you to look after treatment. The wire threads through the brackets and, as the wire tries to return to its original shape, it applies pressure to move your teeth. Picture your tooth resting in your jaw bone. With pressure on one side from the arch wire, the bone on the other side gives way. The tooth moves. New bone grows in behind. Attached to your braces, elastics (rubber bands) exert the proper force that creates the right amount of pressure to move teeth. In order for this force to remain constant, elastics must be worn all the time and changed every day.